Dimensions 0.50 by 11.75 by 9.75 in. Amazon.com description: Product Description: Max and Arthur are friends who share an interest in painting. Arthur is an accomplished painter; Max is a beginner. Max's first attempt at using a paintbrush sends the two friends on a whirlwind trip through various artistic media, which turn out to have unexpected pitfalls. Although Max is inexperienced, he's courageous and a quick learner. His energy and enthusiasm bring the adventure to its triumphant conclusion. Beginners everywhere will take heart. 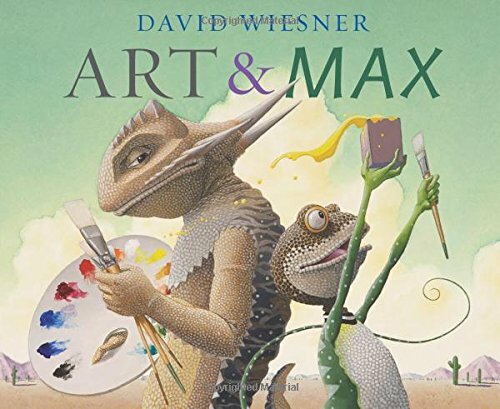 from Clarion Books (October 4, 2010); titled "Art & Max"
About: Max and Arthur are friends who share an interest in painting.